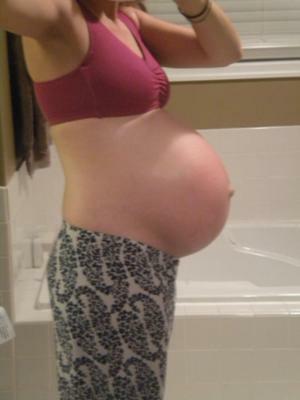 33 weeks pregnant with fraternal twin boys. Babies were born at 37 weeks weighing 5lbs 8oz each. Great pregnancy with a wonderful natural and unmedicated birth. Babies were born 5.5 hrs apart! My twin identical girls were born at 37 weeks also. And had them naturally. One weighing 5lbs. 4oz. and 5lbs. 7oz. born 7 min. apart. Yours were actually 5 hours apart??? I was exhausted after delivering Baby B 7 min. later, but everything went so smooth and fast! They are truly a blessing and everyday is a new adventure! wow! your belly was amazing! congratulations on your new blessings! hopefully i can be so lucky as to have a natural birth as yourself! What a great picture! You look amazing. The body is so incredable and you are such agreat example of being healthy and strong through pregnancy.